This is a fine photograph, well composed, colorful, and sharp. The photographer has successfully engaged his subject. The popular style he used often features exotic people in striking national or religious dress; sometimes their bodies have paint, tatoos, or scarification. You can see more examples of this style here. 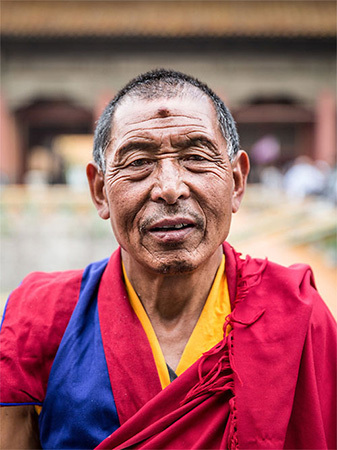 As striking as these pictures can be, there are other styles available for photographing people in your travels. Here are some that I used in a recent trip to Cuba. 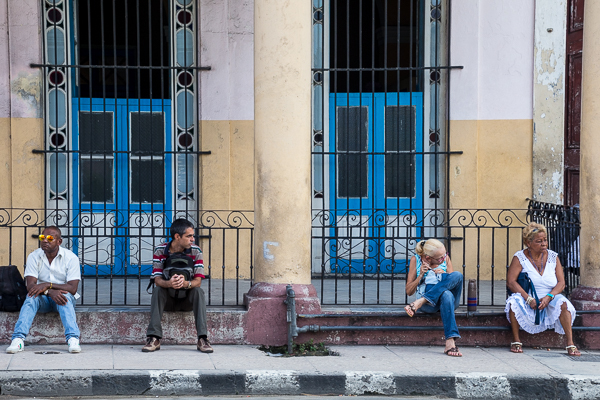 The day I arrived for a week in Havana, I knew that “capturing the essence of Cuba” would be an impossible task. In our bus rides from one tourist spot to the next, I noticed many charming and quirky shops. 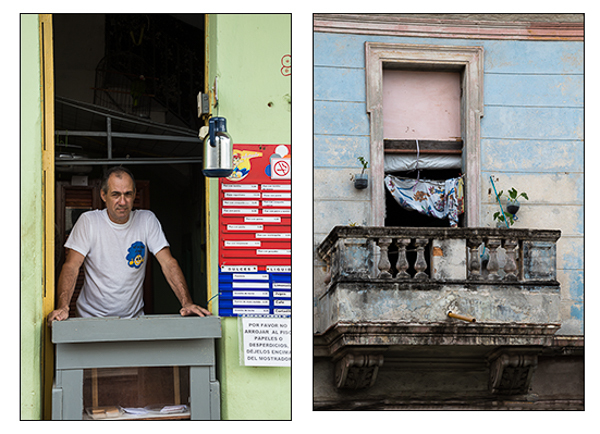 Why not photograph the shopkeepers of Havana? This gave me a sense of purpose and steered me away from snapping everything I saw, like classic cars, cute children, and colonial churches. “Shopkeepers” was fairy arbitrary; I could just as easily have picked pedicab drivers. My shopkeeper choice allowed me to tell my subjects I was doing a documentary project about them and show pictures I’d already taken. The more I took, the more street cred I got. Most travelers tour in groups and some countries even have restrictive rules about solitary visitors. 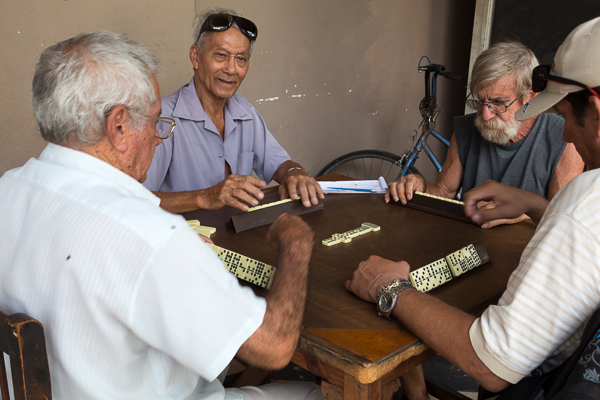 For example, Americans could not visit Cuba in 2015 unless with a “cultural exchange” group. This presented a problem for photographers who like to explore. Tour buses usually stop only at tourist sites, not at places that appeal to photo enthusiasts. Even tours designed for photographers can’t possible know that a roadside stand with Che on the wall would ring one photographer’s bell and not another’s. The solution? After a day or so, find a local photographer, mature student, or professional and ask where the markets are that they – not tourists – shop at. Then hire a cab for a few hours and knock yourself out. You will be amazed. Have a rough familiarity with the language. 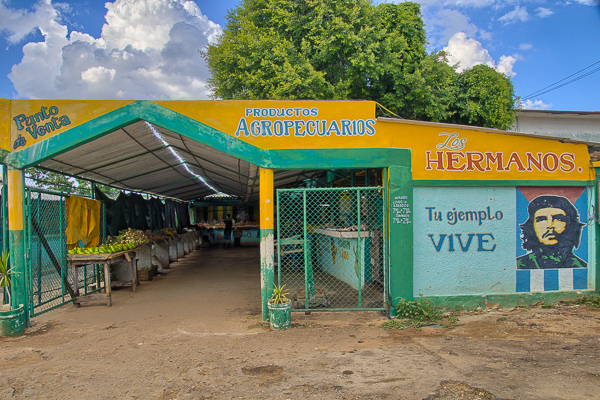 For Cuba, I knew enough high-school Spanish to communicate in this wine shop. But I was having trouble getting the people to relax. They moved around so much (perhaps shy) that I could not get a good picture. Then I asked the young woman why she was carrying around a water bottle in a wine shop, and was she aware that she was hurting the feelings of the wine-seller? They all found this quite hilarious and I snapped this shot. When I began to take pictures in the neighborhoods of developing countries, I was timid. I thought it might be okay to photograph a scene from a distance, without “interfering.” This is what I came up with. While the people at the right are looking at me, I am more of a curiosity to them. The woman in white doesn’t even notice me. The stall is underexposed because of the bright columns. I examined the picture and decided it wouldn’t do. Then I approached the proprietress and spoke to her. Walk right up to people and say what you’re doing. Tell them why you are interested in them and what you’d like to do. But be prepared to move on if you don’t succeed. For example, if someone is really timid, don’t try to persuade them, no matter how “colorful” they look. I know, the street photographers will kill me for this one. But a tripod enhances your chances of getting sharp, level, and steady pictures, particularly on shady streets. 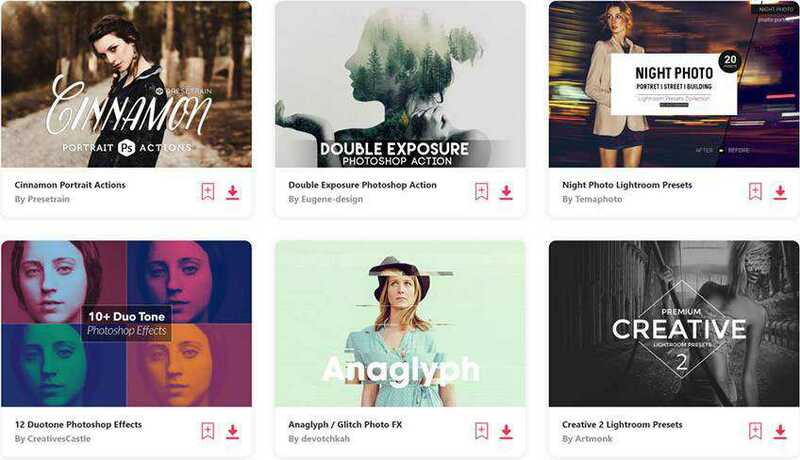 It also brands you as a professional, or at least someone serious enough about photography to set up a shot. You’re not just some tourist grabbing a snapshot while on the run to the next hot spot. The afternoons my friend Matt and I were photographing Cuban neighborhoods, it was hot and humid. Streets were full of air pollution. (Those picturesque Cuban cars have no catalytic converters.) After two hours, I called it quits. “Why are we stopping?” Matt asked. “we’re just getting going.” An hour later, in an air conditioned cafe, he was glad we did. Photography is inherently an intensely physical activity. Add to that, talking to people and negotiating each shot, in the bright sun, surrounded by city air pollution (ubiquitous in the third world), and you can rapidly approach a state of collapse after two hours. Stop before that and continue the next day. At least not slavishly. 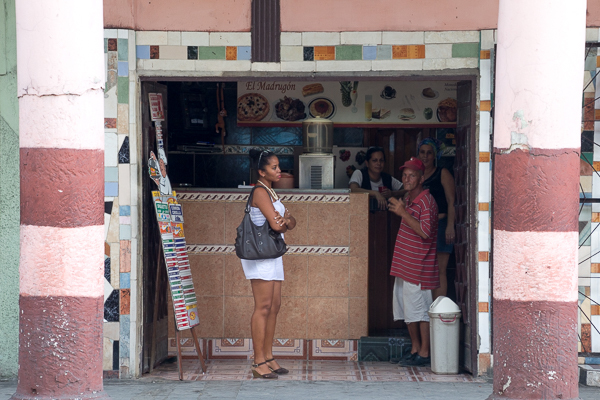 During our tour of Cuban neighborhoods, my driver Andreas stopped and said, “You want dominos?” “What?” I thought. “They have Domino’s Pizza here?” He then pointed to four men playing dominos at a storefront. Well, I thought, at least it was the front of a shop. He introduced me as a “famous American photojournalist.” After a few shots, I got one of them to look up. In 1975, I visited Morocco with a super-8 camera. 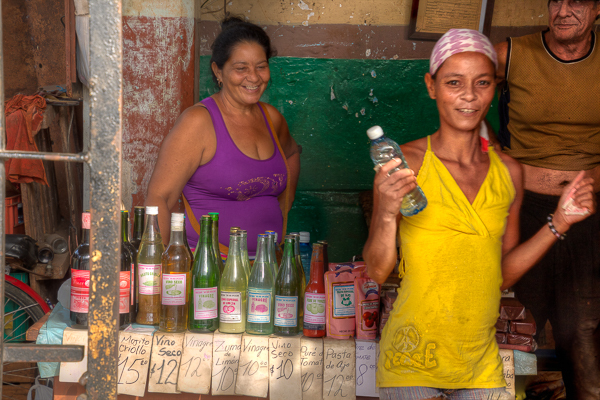 I noticed other people in our tour paying a flamboyantly dressed water seller to pose for them. I thought I was being clever by filming him as he walked away, thus avoiding his posing fee. As you can see, my clip came out terrible. There was no engagement with the man, no hope of placing him in a better composition without his help. But at least I was 75 cents richer. 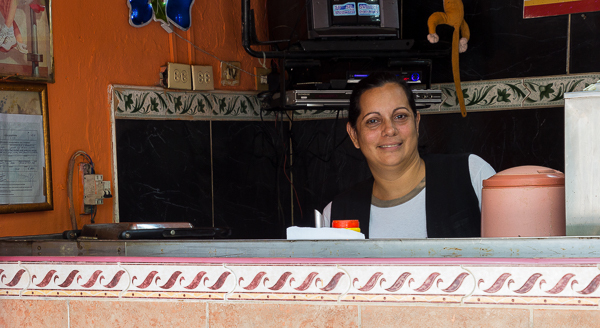 Find out from your guides or locals if people expect to be paid for being photographed. Keep enough local cash in small denominations. What’s true in India and Thailand may not be so in other parts of the world. 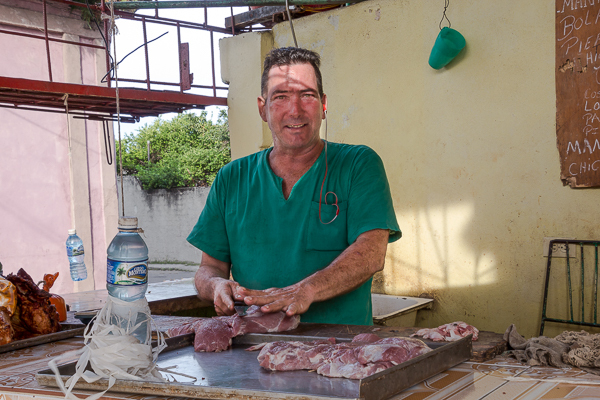 When I was in Cuba, I took a picture of a cigar seller. He was not hawking his image at a popular tourist spot like others I’d seen, but I still thought I should pay him. My driver stopped me. “He’s not looking for money, he has a job.” I ended up just showing him the picture and he flashed a toothless grin. Speak as much as you can with your subjects. 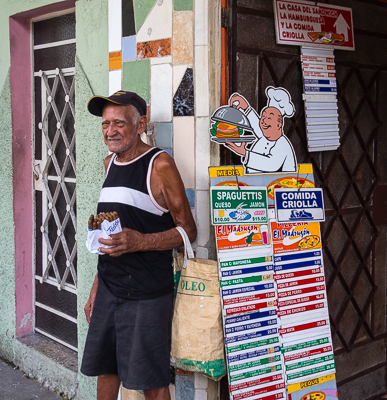 After I photographed this baker, he started telling me more about his life. He pointed out that he lived in the next door apartment. Old balconies collapse at the rate of two a day in Havana, so I asked him if he was concerned. He said that he’d lived there as long as he’s had his shop, so no, he wasn’t worried, at least not enough to move. Then he added with a smile that when it collapses, he hoped he won’t be out on it. Ask people about their families. Maybe they’ll tell you about where they live. Sometimes if you get people to talk, they will not only tell you astounding stories, but also give you more to photograph. They may even invite you up for coffee.